This heart-shaped ice cube tray is too expensive of a purchase for the quality that it gives. The ice cubes won't come out easily, and if you attempt to get them out the tray feels like it'll break. The heart-shaped ice cube tray is a waste of money, or points. The tray is 7 inches by 4 inches. It is made of a very hard, non-movable piece of plastic. 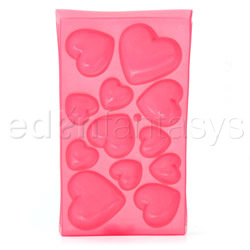 The plastic features different sizes of decorative heart designs molds. I purchased the tray with the idea of making jell-o jigglers, or kool aid ice cubes out of them. I tested the tray with just plain water first. The ice tastes like plastic, even after the ice tray had been washed several times. It is dishwasher safe, but I only hand washed it a few times. I do not feel safe using a product that gives the food (or water) a flavor, or a smell, of plastic. I’m not very happy with the purchase of the tray. It is cheaply made, especially for the price that was paid for it. The frozen ice cubes are hard to get out once they are fully frozen. With a normal ice cube tray, you are supposed to be able to twist them from side to side, to pop the ice cubes loose. There is no twisting this tray unless you want it to break. The plastic is very firm. This ice cube tray is extremely expensive. I bought it thinking it would be like one of those new Rubbermaid kinds that have the nonstick stuff on them. Wal-Mart sells two design ice cube trays in a package for $0.97, and they make even more cubes in just one tray. The heart shapes would be great for anyone; kids, adults, and parties. You could also use it to make candy shapes, Jell-O shapes, and to add a little variety to your drinks. They can also be used for some added fun in the bedroom, too. They would hold paint for painting small pictures, as well. The ice cube tray is allergy free. I assume it's BPA free, too, since food does go in it. The packaging is user friendly for all ages. The package features a lady holding wine glasses, like a waitress would do. I still use the ice cube tray, but have to use a knife to get the. Ice. Out. Of the tray. Thank you for viewing Heart shaped ice cubes tray – gags review page!